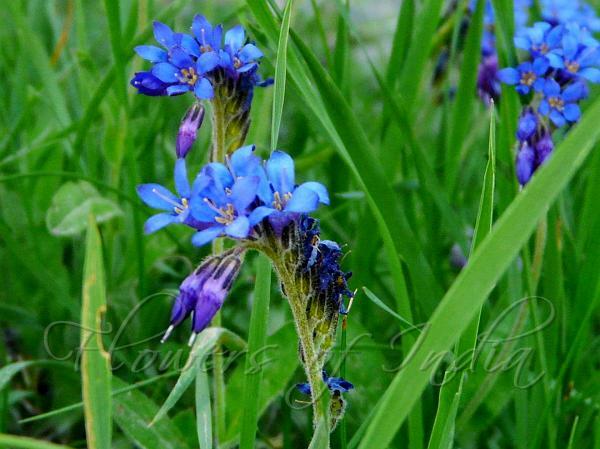 Bugloss Alpine Bluebell is small, softly hairy perennial herb, with dense many-flowered cluster of blue-purple tubular flowers. The flowers are characterized by its not spreading petals and long protruding style. Flower-tube is slender, about 7 mm, without scales in the throat, one third as long as the linear, bristly sepals. Inflorescence remains dense in fruiting. Leaves are oblong blunt to inverted-lanceshaped. up to 18 cm. the lower narrowed to a long stalk, the upper few, smaller, stalkless. Stem is slender, unbranched, usually 15 cm or more. Nutlets are about 2 mm, white, shining. 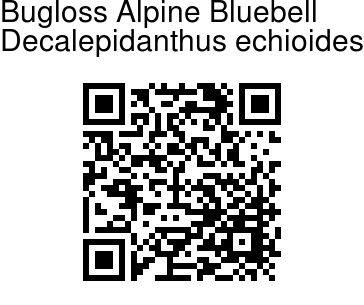 Bugloss Alpine Bluebell is found in the Himalayas, from Pakistan to Himchal Pradesh, at altitudes of 2700-3600 m. Common in Lahaul. Flowering: June-August. Identification credit: Nongthombam Ullysess Photographed in Lahaul, Himachal Pradesh.